It lies under the sternocleidomastoid (SCM) muscle, opposite the upper four cervical vertebrae. It rests upon the levator anguli scapulae and scalenus medius muscles, and emerges from the posterior border of the SCM. Its branches consist of a superficial and deep set. The superficial branches are the great auricular nerve, lesser occipital nerve, transverse cervical, suprasternal, and supraclavicular nerves. 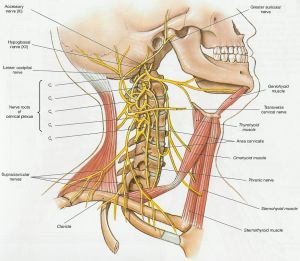 The deep branches are the phrenic, communicantes cervicales, communicating, and muscular. ↑ 3.0 3.1 3.2 3.3 3.4 3.5 Thompson JC (2010). Netter's Concise Orthopaedic Anatomy (2nd ed). Philadelphia, PA: Saunders Elsevier.